The closest Muni station is the Forest Hill station, (where you can get the K,L, M and T lines), opposite Laguna Honda Hospital. The closest BART station is at Glen Park, where, ironically, there is no parking. Forest Knolls is served by one bus-route, the 36 Teresita, which operates between Forest Hill Station, Forest Knolls, and Midtown Terrace. (Following a recent route-change on that stretch, the other leg of the route goes from Forest Hill Station out to Glen Park BART station and on to St Luke’s Hospital at Cesar Chavez & Valencia – see below). 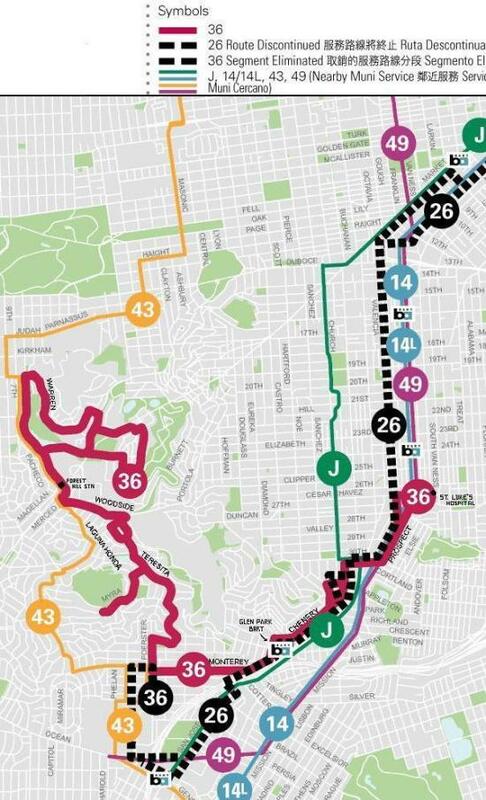 Here’s the new route of the 36 Teresita (dark pink). The dotted black lines show a discontinued route. Starting 5 December, 2009, the 36 Teresita was re-routed to go to Glen Park BART station and St. Luke’s Hospital (part of the 26 route) instead of Balboa Park. The section between Forest Hill Muni station and Forest Knolls was not affected. The rush-hour frequency was formerly 20 minutes, but is now 30 minutes. (It was 20 minutes on weekdays 7-9 a.m. and 4-6 p.m., 30 minutes at other times). Details on all Muni route changes are here. The the MTA website still shows the old routes, but they’re fixing it. When it’s done, it will have route information and a time-table. The former route is shown below. This is great information to post. It’s my impression that San Franciscans and future homeowners don’t know enough about Forest Knolls & its surrounding neighborhoods. Keep up the good work. I will point my clients in your direction.